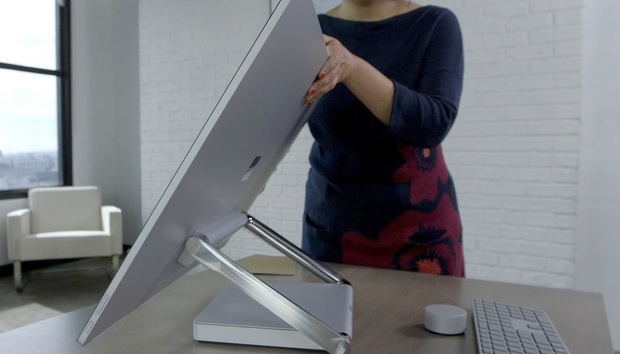 Microsoft’s Surface Studio is the ultimate Windows All-in-One, the showcase for Windows 10’s biggest innovations—especially some of those coming in the Creators Update. We just received our Surface Studio loaner and couldn’t wait to open the box. The very big box. Watch as we unwrap everything and talk about the specs. This highest-end SKU has a mobile Core i7 Skylake CPU, 32GB of RAM, a 128GB SSD with 2TB HDD, and Windows 10 Pro. You can’t miss the 28-inch PixelSense Display with a dazzling 4500x3000 resolution. The Surface Pen we know well from using the exact same model with the Surface Pro 4. The keyboard and mouse seem almost like afterthoughts compared to the Surface Studio’s build quality, but we’ll tell you more about them once we’ve used them for a while. The Surface Dial is the most unusual part of the Surface Studio. You place the puck-like Dial on the display—its bottom surface sticks surprisingly well, though it’s intended to be used when the display is prone—and press it to summon menu options, and turn it to select options. It’s designed to be more intuitive than mousing around. We plan to spend a lot of time with the Surface Studio, so stay tuned for more coverage on PCWorld.